One Thousand and One Nights is a narrative framework that comes to us from the Middle East. It tells of a woman named Shahrazad who was to be put to death by a ruthless and tyrannical Persian king. But the wise woman used her powerful gift of storytelling to save her life. Every night she would tell the king a story, but before retiring for the evening she would start a new one. The king, anxious to hear the rest of the story, would stay her execution. For 1001 consecutive nights she recited her stories to the king. By the last night, when she had no more stories to tell, the king had fallen in love with her, and spared her life. She had literally saved her life through storytelling. Seeds of Empowerment hopes to capture this same spirit by giving impoverished children throughout the world the ability to tell their stories, make money, and in so doing bring a better life to them and their families. 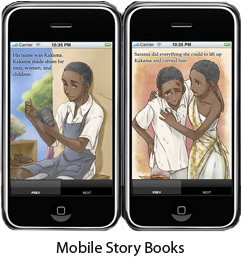 The project is called 1001 Stories and the concept is fairly simple—children from all around the world will tell a story. The story is recorded and the best story is chosen to be illustrated, narrated and turned into a digital book that can be downloaded and shared. Money donated toward the purchase of the story will then be given to the child. The goal is to have 1001 stories from all different parts of the world—stories that not only tell a global tale but empower children to be entrepreneurs. This process has already resulted in some very powerful and beautiful stories that you can download to your mobile device. But the process for bringing these stories to life is not without its problems. One of the most difficult things is procuring quality stories. Children in these impoverished areas do not have a firm grasp of story mechanics, and many are shy and have trouble thinking of a story to tell. The process is also very time consuming—compiling a team that records stories, another team to read and select the best ones, and an artist to draw each story page is a lengthy process. Considering that the vision is to compile 1001 stories, you can see how this becomes a lofty goal indeed. There are, I think, some ways to streamline the process, get quality stories, and increase the financial boon of the storytellers. One way to do this is to solicit a child’s imagination by having them add to an existing story. Drawing from local folklore and traditions, the volunteers can ask the children what the characters from well-known stories are doing now. Where are they and who are their friends? Are they happy or sad and what new adventures have they been on? Children will add their own vivid details and descriptions to these stories when there is already a base established in their minds. Using traditional folktales to engage their imagination and help them continue the story aligns with the spirit of One Thousand and One Nights, where the narrative text was layered and always continuous. I also feel that improvements can be made with the recording medium. I think that taking video of the children telling their stories would help in several ways. First, if the stories are grounded in traditional tales, they are rooted in an oral experience. Stories are told after all, and capturing them on video would be a natural means of conveyance. Second, these videos can be uploaded to a YouTube channel where the vetting process becomes crowd sourced. Users can watch the videos, complete with captions if need be, and vote on their favorite stories. The videos with the top views can then be selected to participate in a competition for a grand prize. Illustrating the stories can also become part of the contest. The videos with the most views can solicit a response from artists (ideally children with artistic promise) who can submit their own drawings for consideration. The grand prize storyteller for that region would then receive a substantial monetary reward that they could share with their family and perhaps their school. I see the future of this project as being adopted by the elementary school curriculum in the United States as a way to connect students to their global peers. To learn about different cultures, traditions and stories is part of a holistic education. Children will download these stories to their mobile phones, share them, discuss them, and maybe even tell a few of their own. And for the storytellers, much like Shahrazad, they will find life-saving gifts in the stories they tell.